The retirement fantasies of relaxing on a porch swing or travelling around the world still exist, just not in this country. 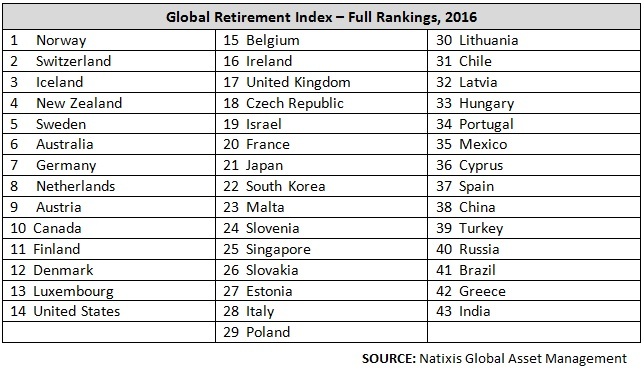 Among the leading nations for retirement security, the United States didn't even crack the top 10, according to the 2016 Global Retirement Index by Natixis Global Asset Management. Europe, however, dominated the top spots, with Norway at No. 1, followed by Switzerland and Iceland. New Zealand ranked No. 4 and Sweden rounded out the top 5, Natixis said. With more retirees around the world responsible for their own financial security, the countries that ranked the best had policies in place to ensure access to individual or work-based savings programs, according to David Goodsell, who directs investor research for Natixis. Recent public spending in top-ranked Norway has bolstered the nation's pension plans, helped in part by the country's massive sovereign wealth fund. Other high-ranked countries, like New Zealand and Australia for example, have moved to universal, mandatory retirement savings plans. Meanwhile, the United States ranked 14th for retirement security, according to the report. Despite benefiting from high per-capita income, stable financial institutions, low inflation, and low unemployment, the U.S. also has one of the highest levels of income inequality among developed nations and a growing ratio of retirees to employment-age adults, which means there are fewer workers to support programs such as Social Security and Medicare. Close to 30 percent of Americans don't even have a retirement account — such as an employee-sponsored 401(k) plan or an individual retirement account, according to a recent study by Personal Capital. As a result, about one in four U.S. workers expects to keep working through age 70, according to a separate survey by Willis Towers Watson. In a survey published last year by the National Institute on Retirement Security, 86 percent of respondents agree that the country is facing a retirement crisis.